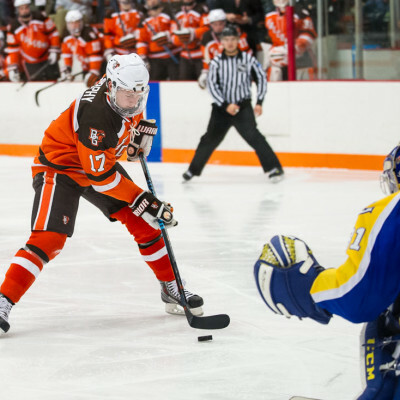 Bowling Green received exactly what it deserved Friday night. 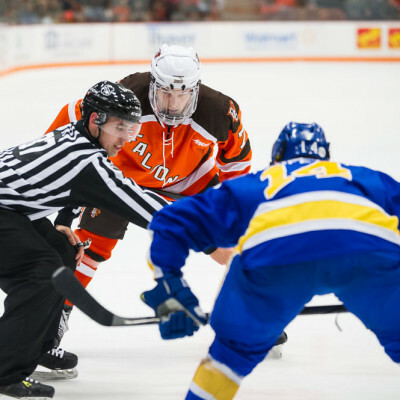 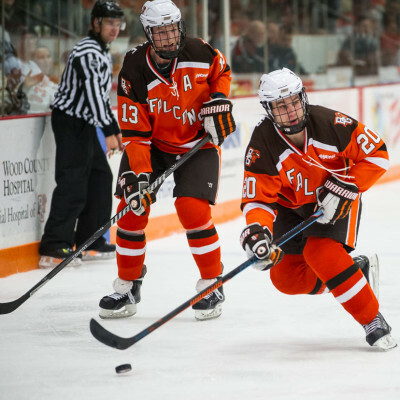 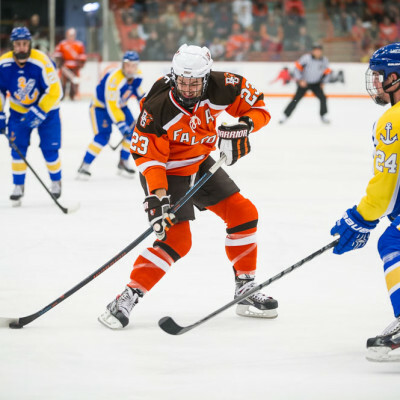 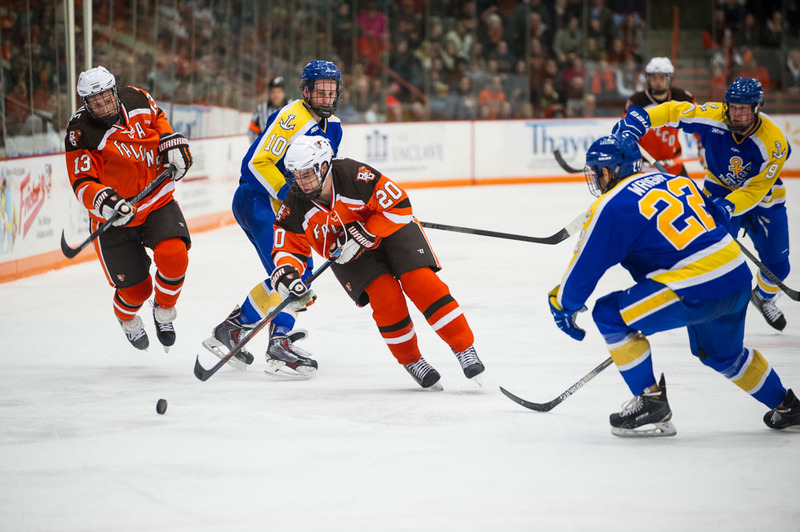 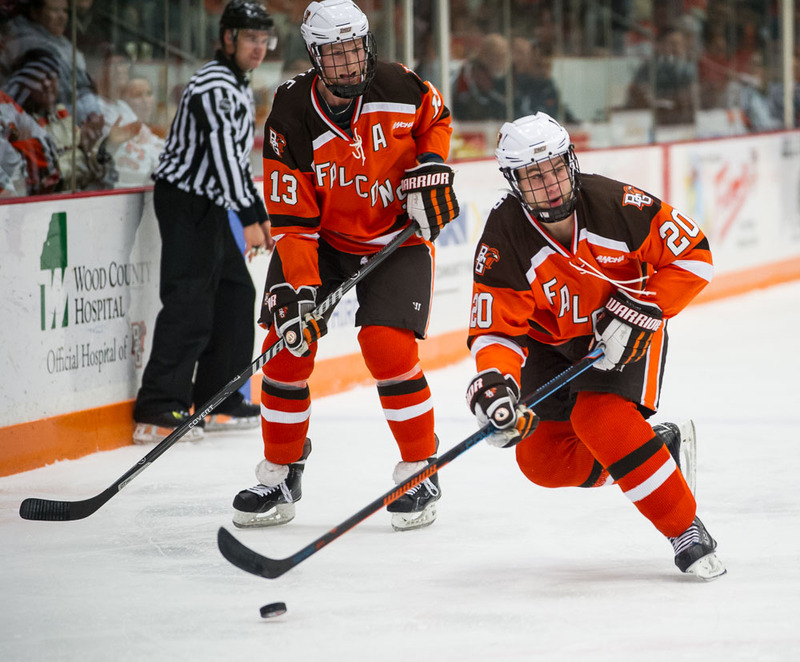 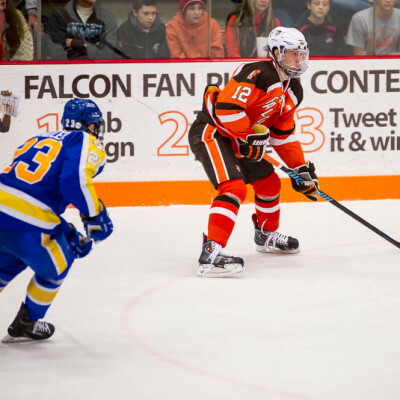 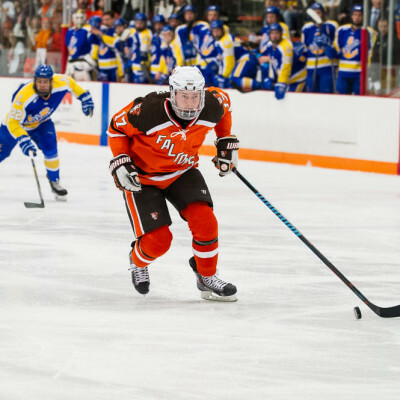 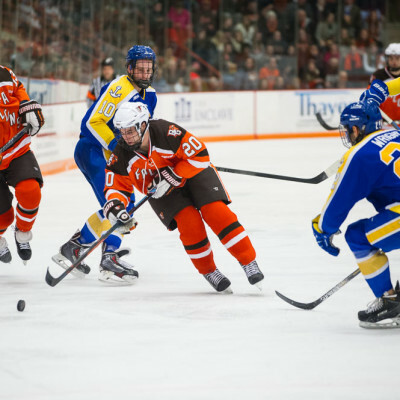 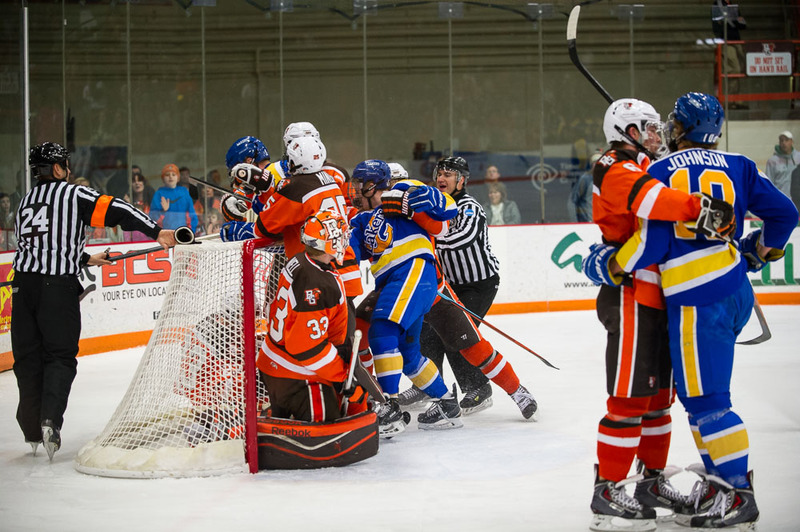 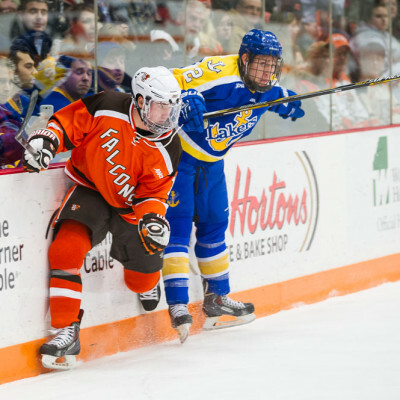 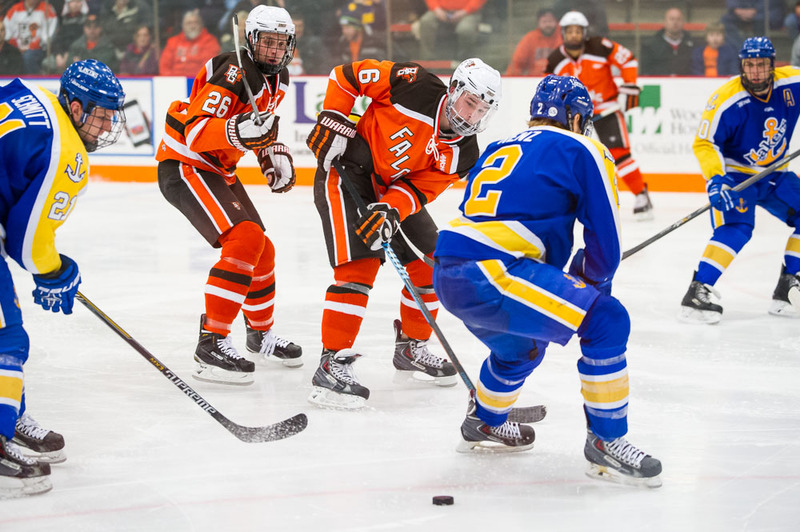 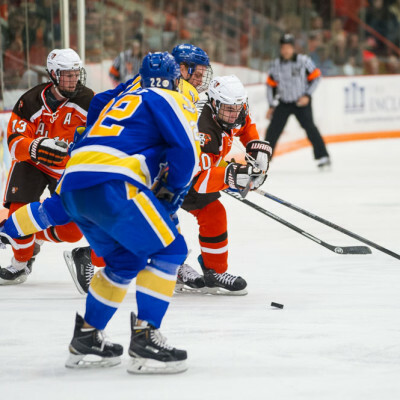 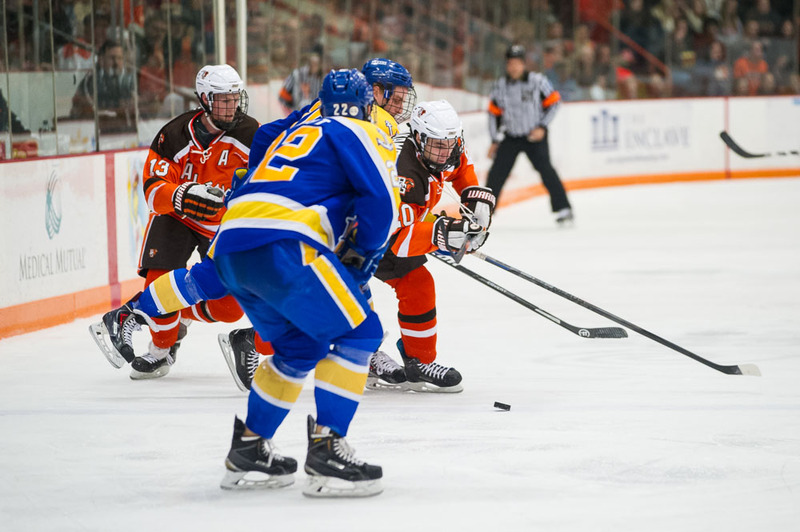 The Falcons hardly resembled the sixth-ranked team in the country, losing a 3-1 decision to Lake Superior in the Ice Arena. 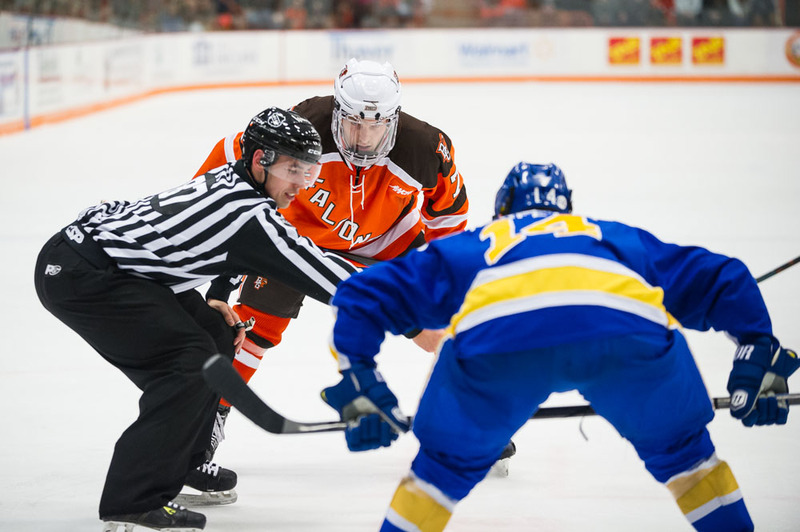 BG wasn’t sharp offensively, defensively or in goal, and didn’t display much intensity or emotion before a crowd of 2,751. 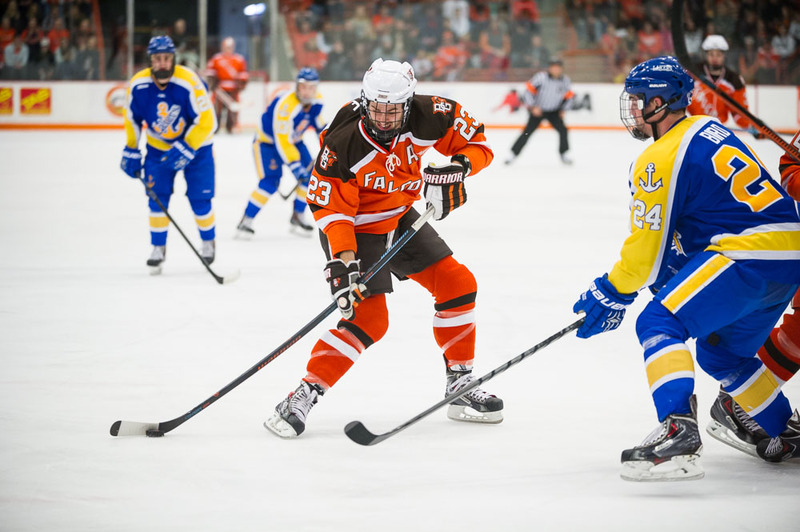 And while the Falcons were disappointing, Lake Superior worked hard and was full value for its victory. 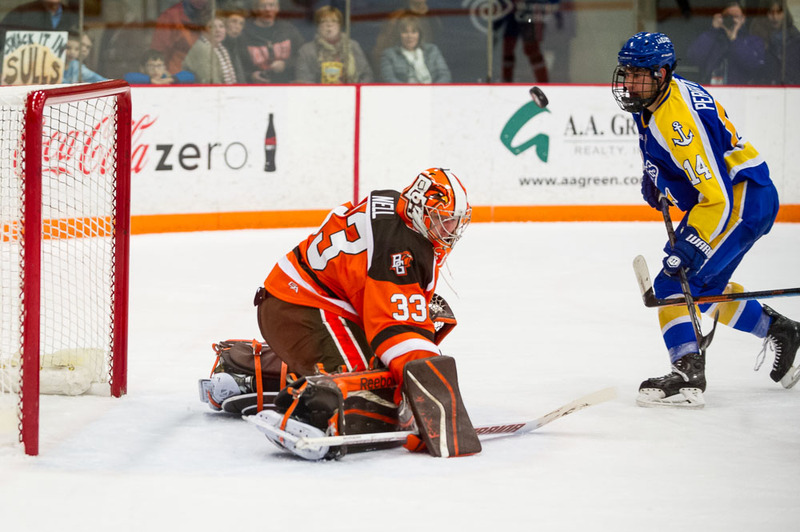 Gordon Defiel stopped 30 shots for the Lakers, who took a 2-0 lead during the first 13 minutes of the game. 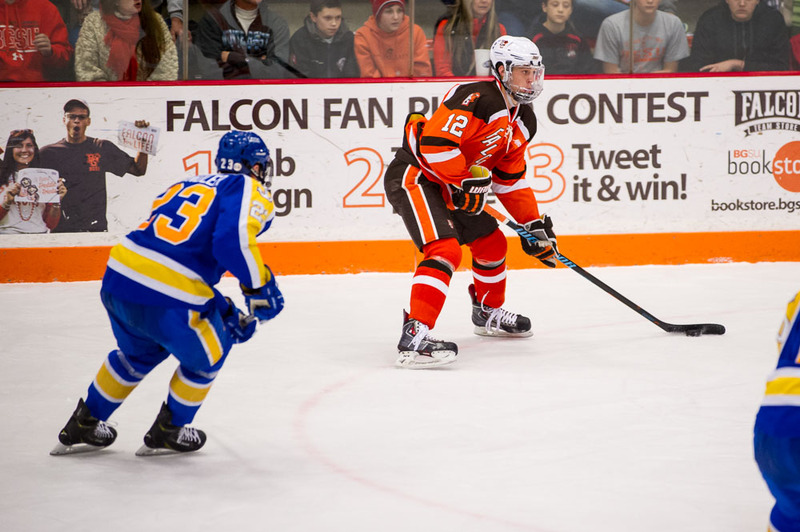 The Falcons finished with a 31-21 edge in shots, but a large portion of the margin came during the third period when BG had eight shots to the Lakers’ one. 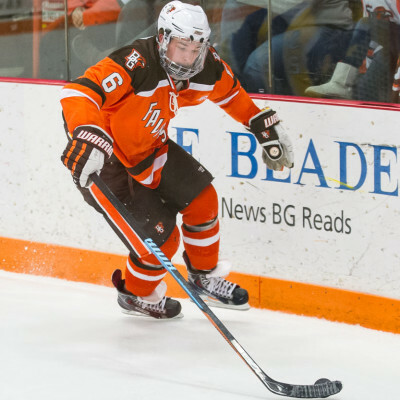 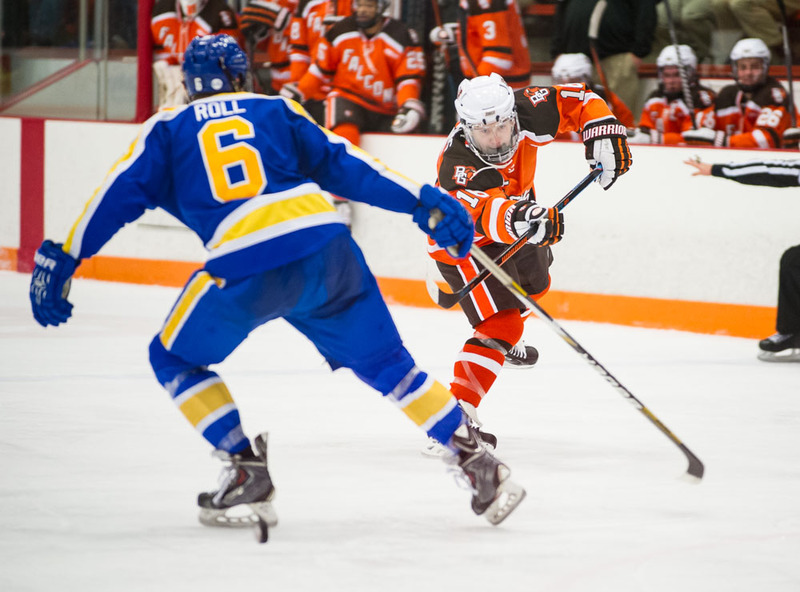 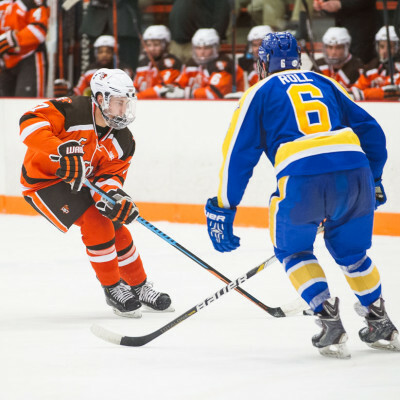 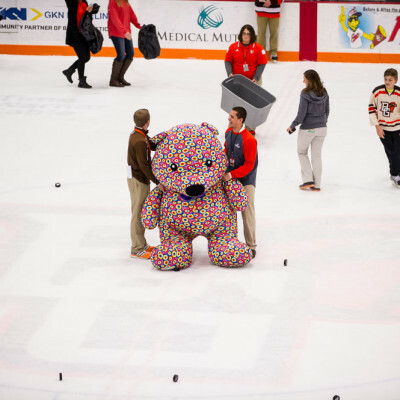 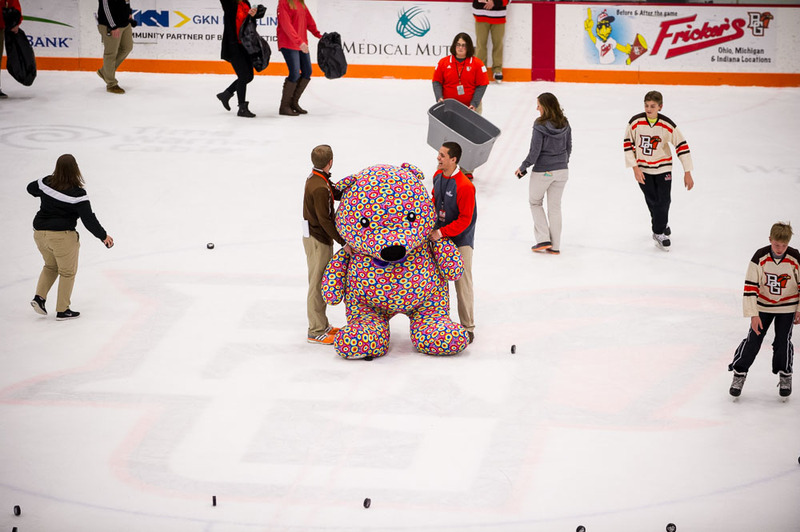 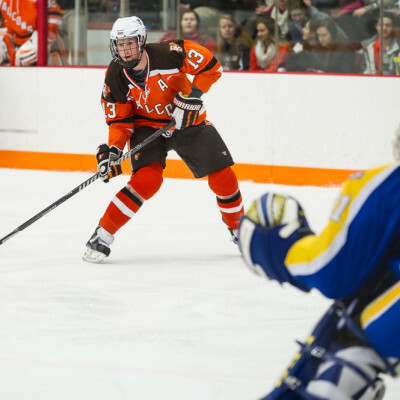 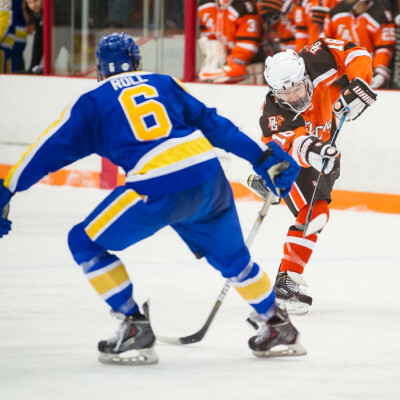 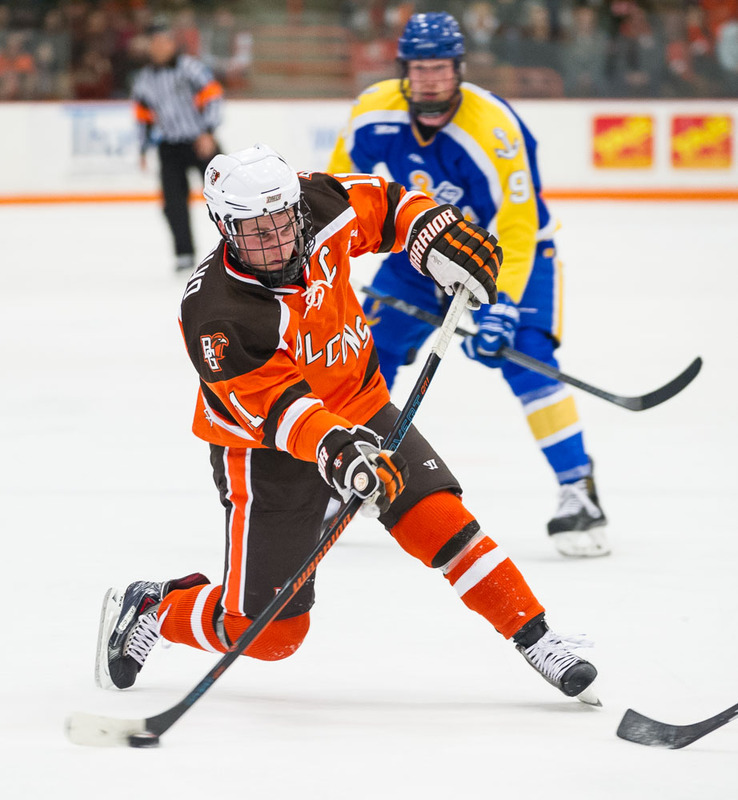 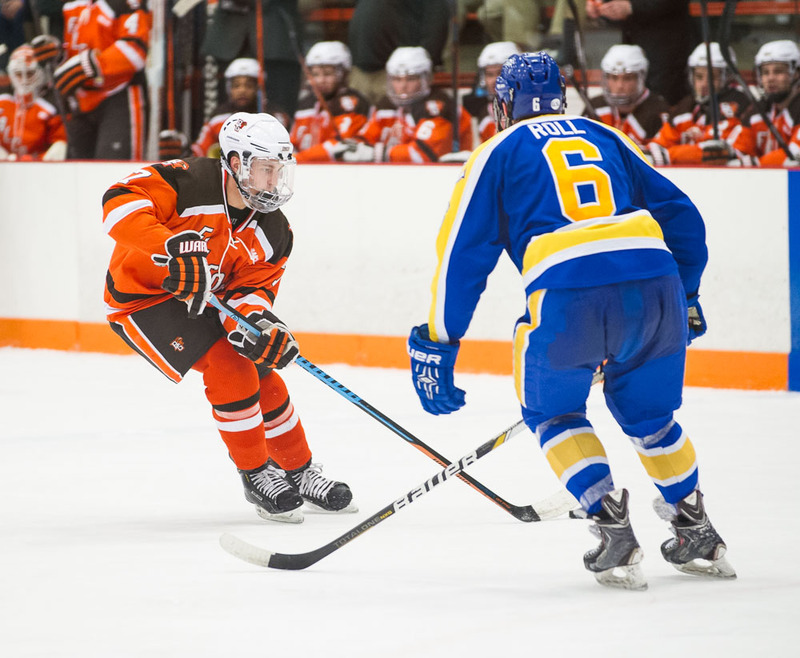 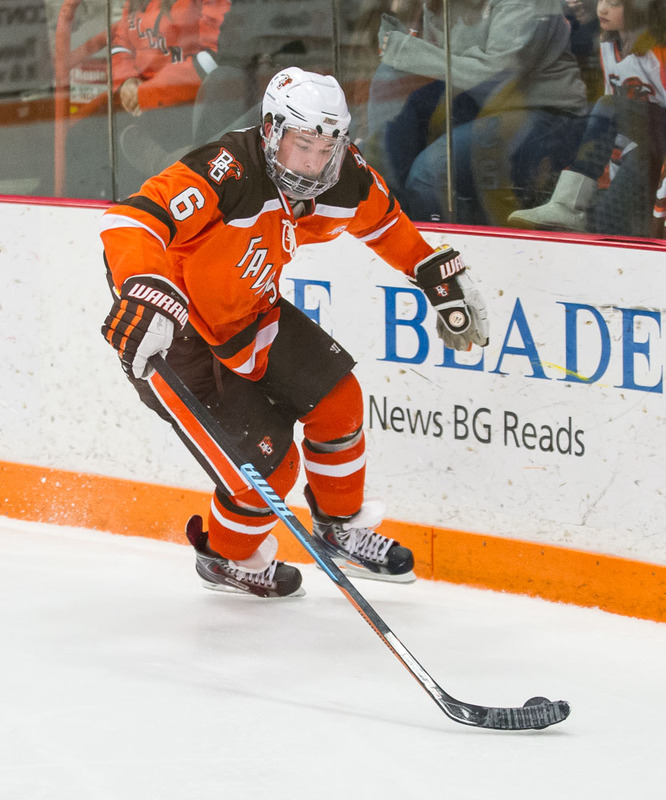 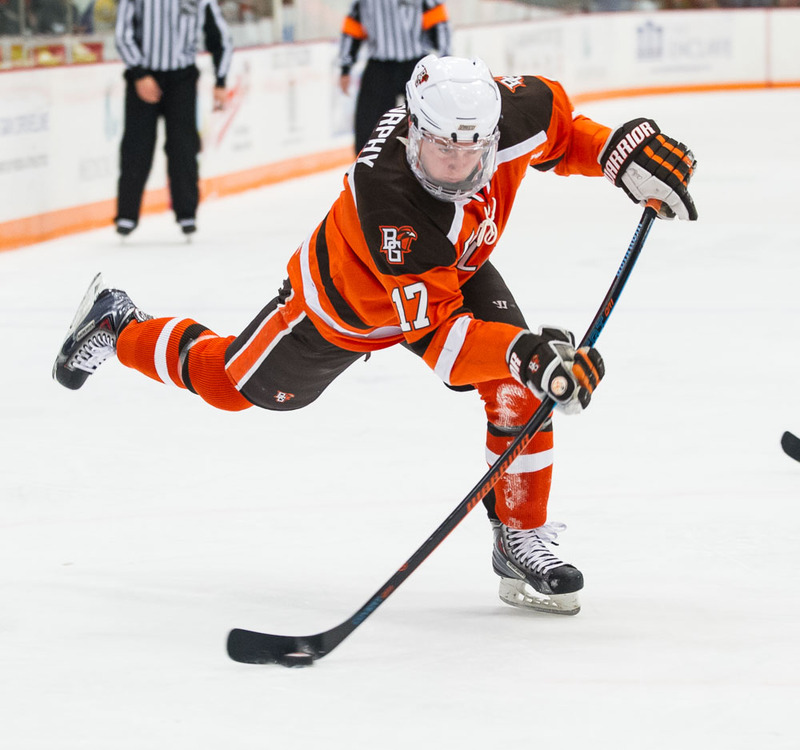 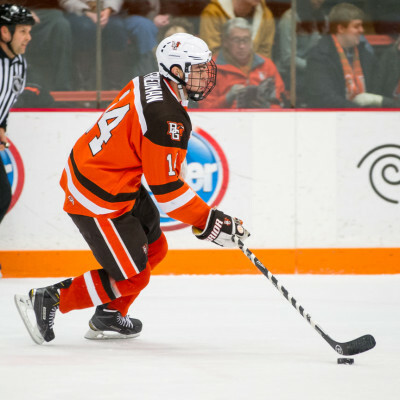 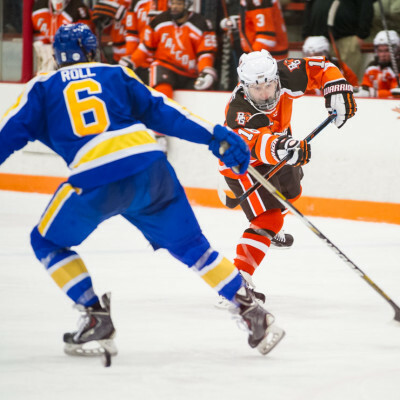 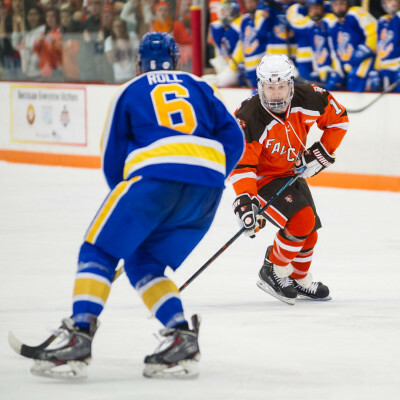 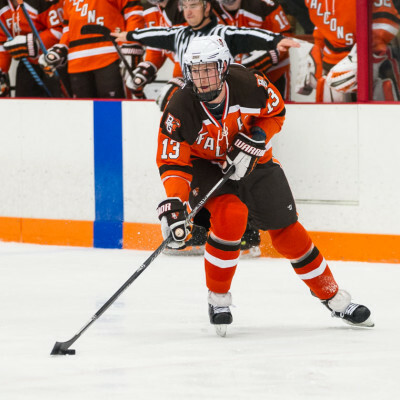 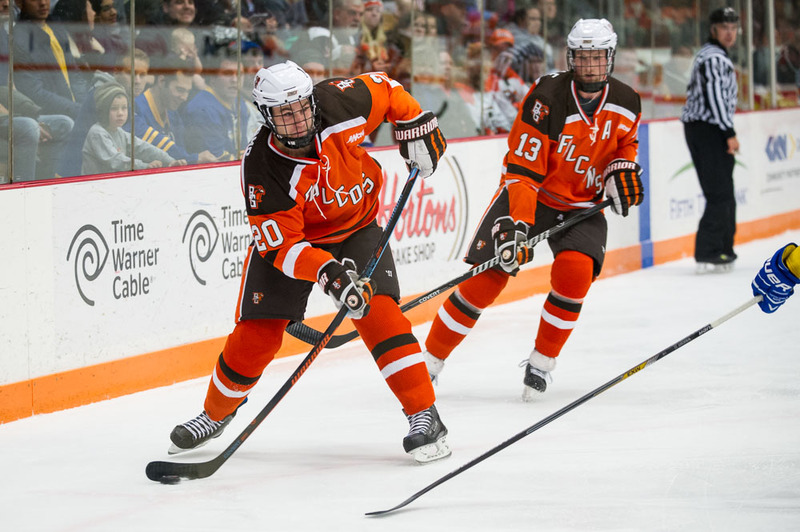 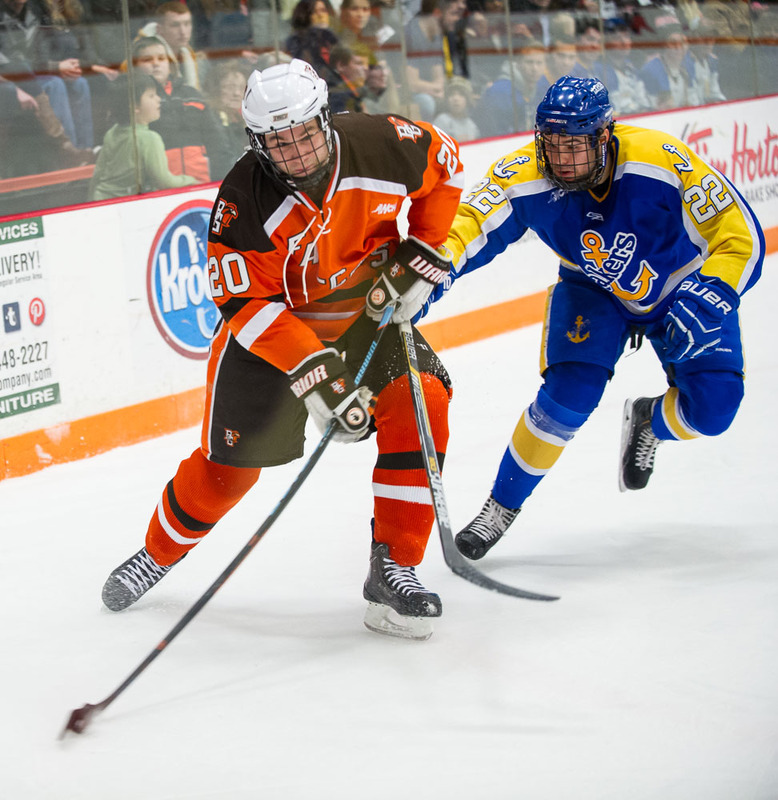 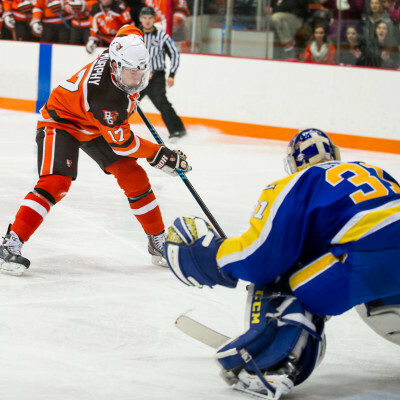 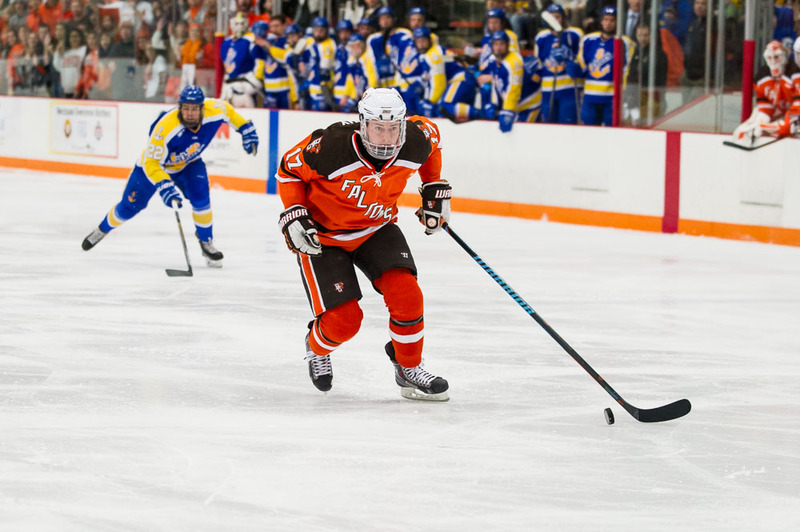 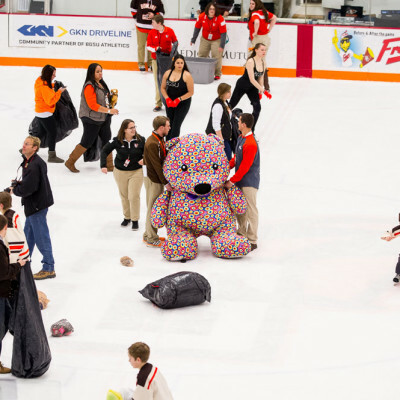 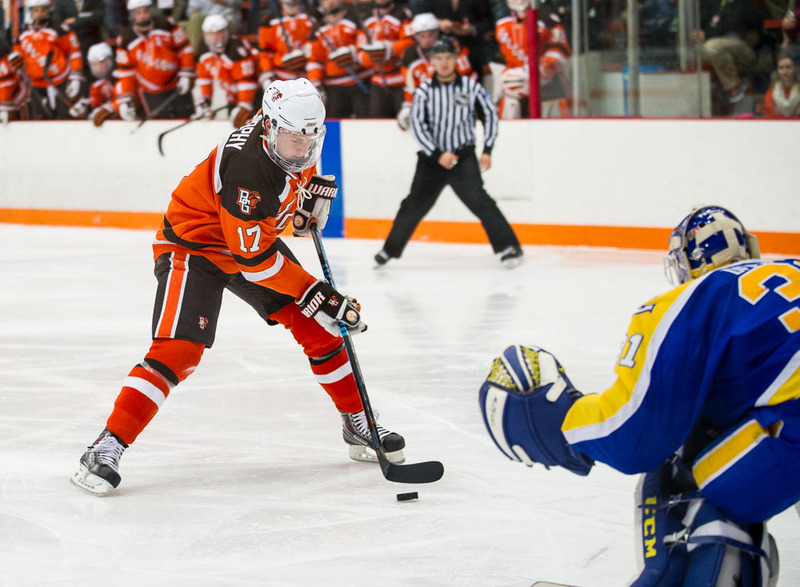 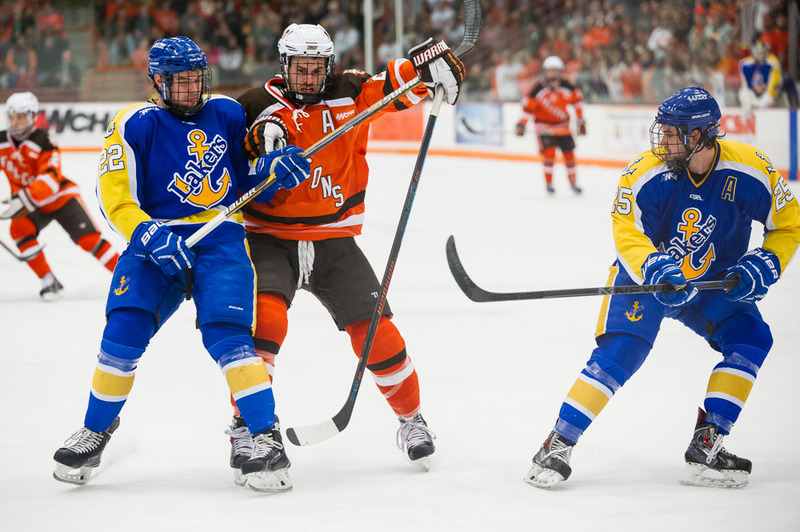 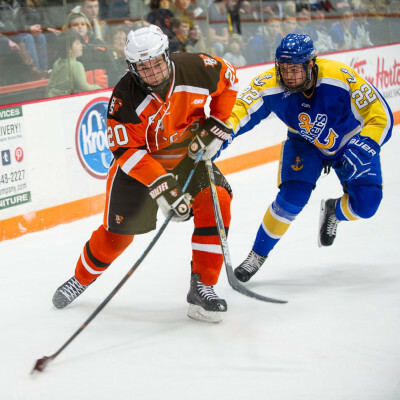 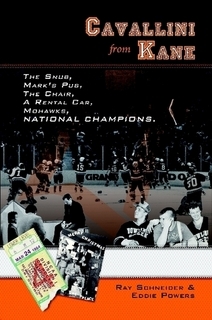 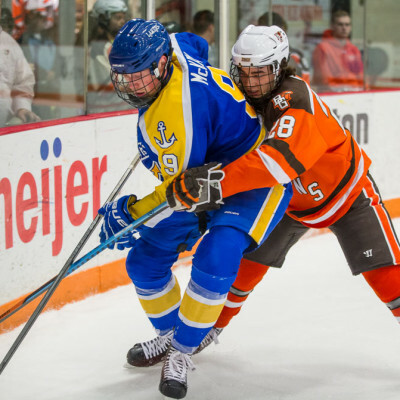 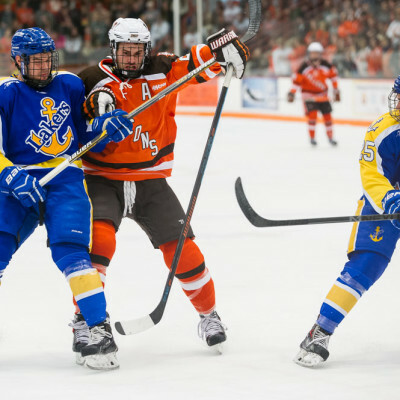 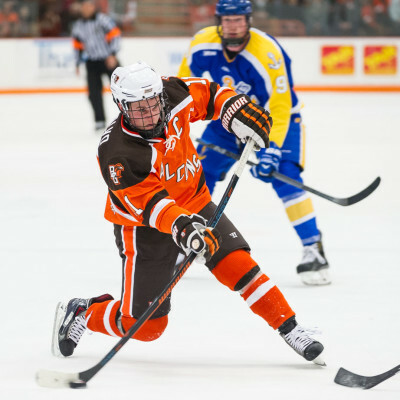 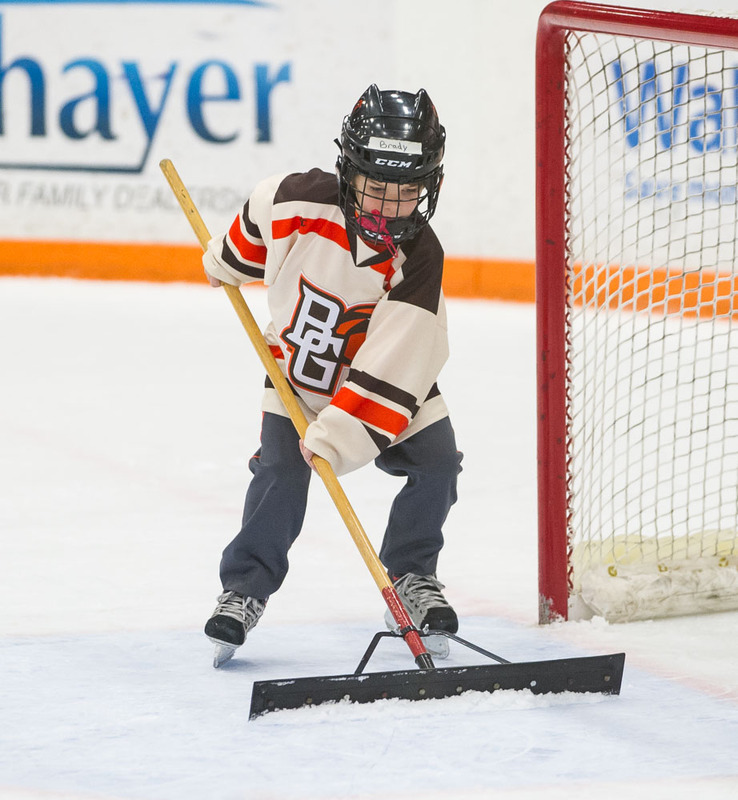 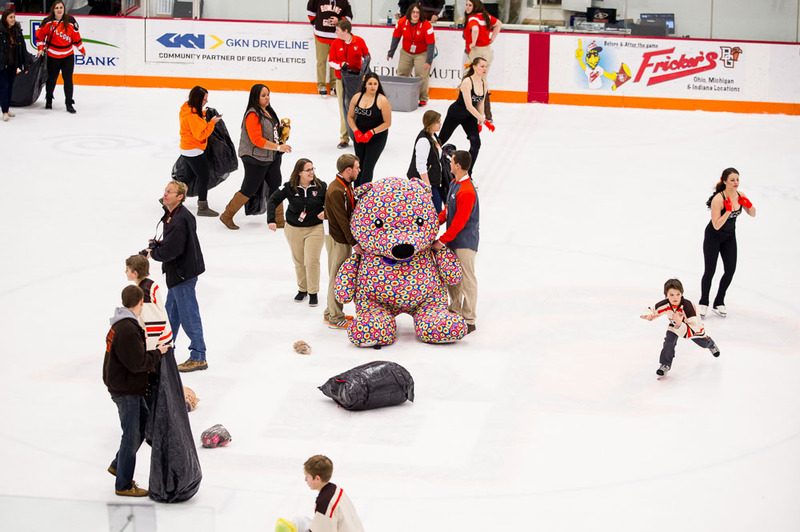 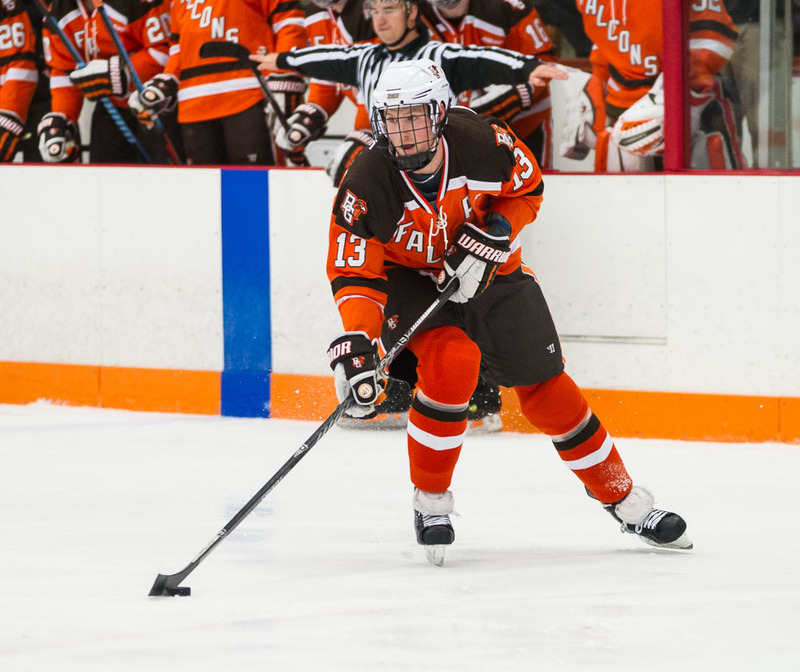 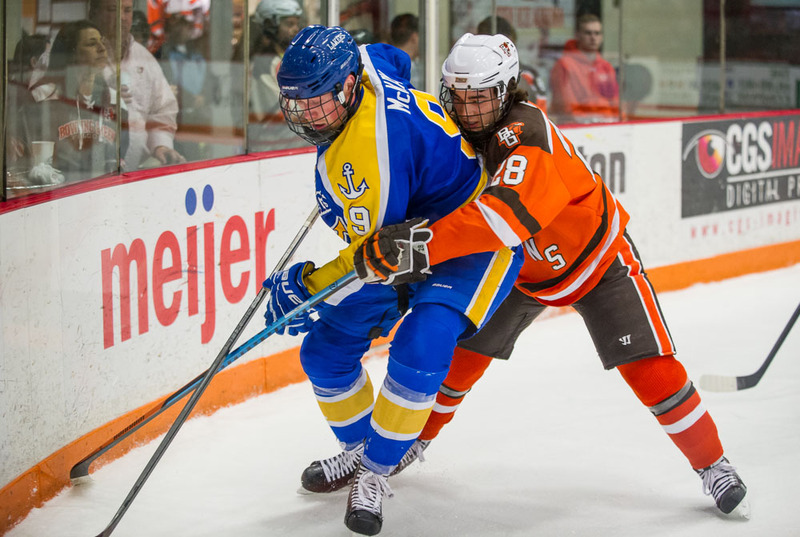 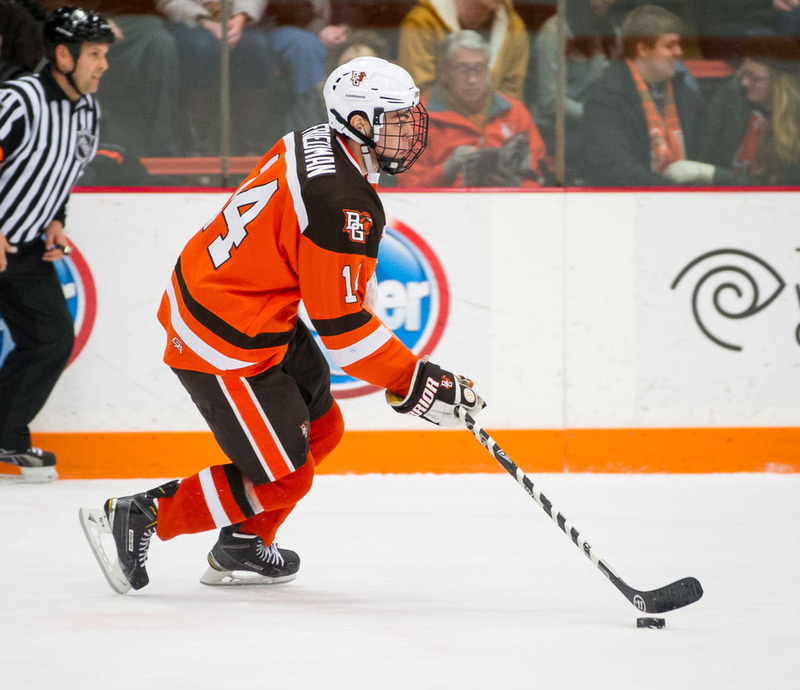 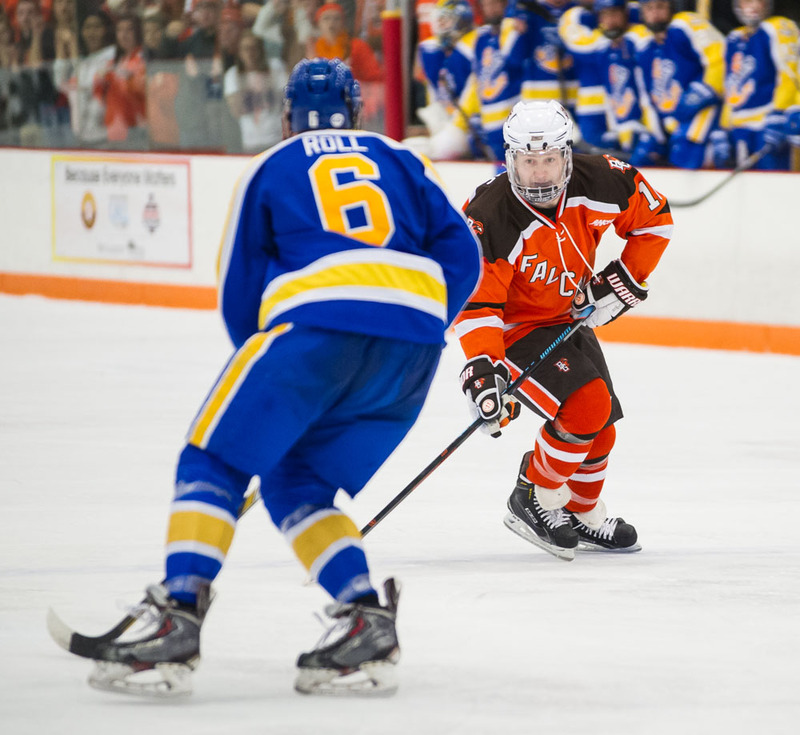 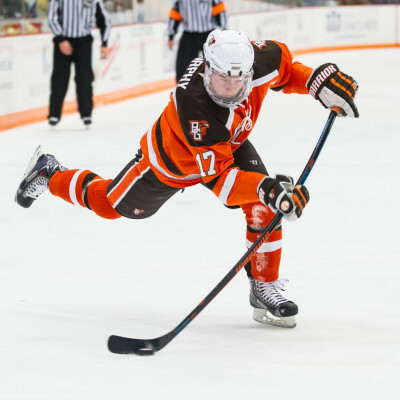 BG fell to 14-5-4 overall and 10-3-2 in the Western Collegiate Hockey Association. 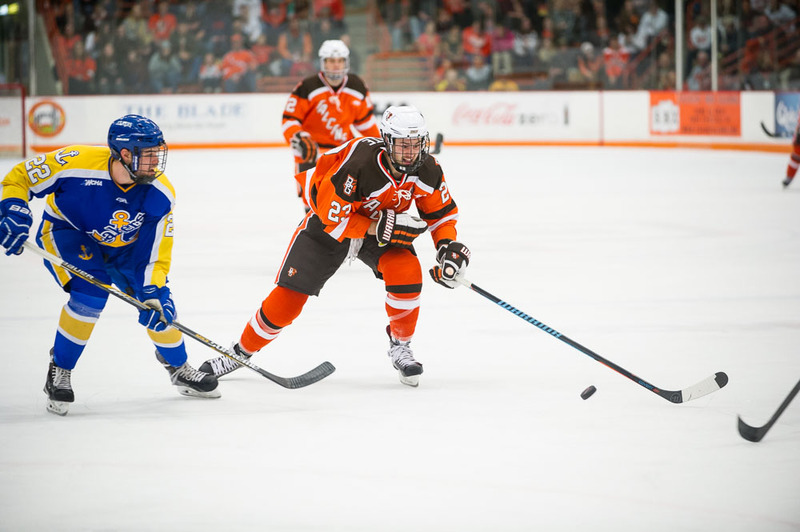 The Falcons dropped three points behind second-place Michigan Tech and remained nine behind WCHA leader and top-ranked Minnesota State. 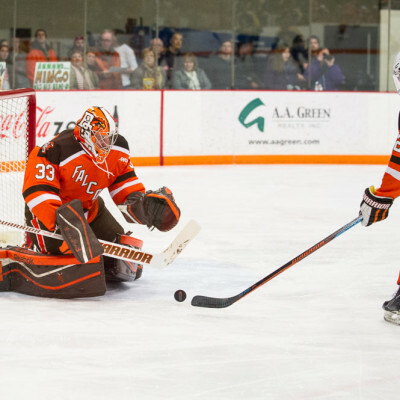 BG has played two fewer games than Tech and three fewer games than Minnesota State. 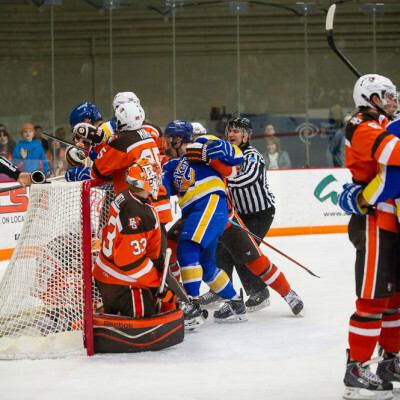 Tech rallied at home from a 3-1 deficit in the final seven minutes to post a 4-3 overtime win against the University of Alaska (Fairbanks), while Minnesota State is playing two nonleague games this weekend. 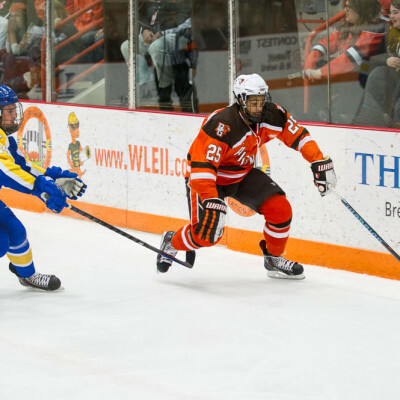 The Lakers (7-19-1, 6-13) won their third straight game to move into a tie with Alabama-Huntsville for eighth place in the WCHA. 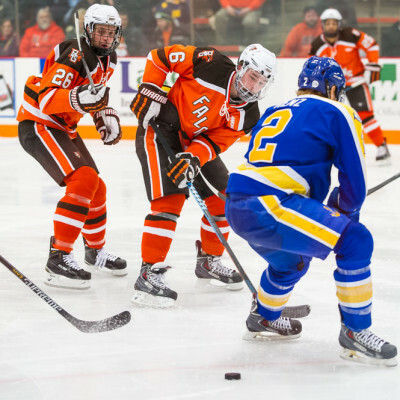 Lake Superior is 4-2-1 in its last seven games. 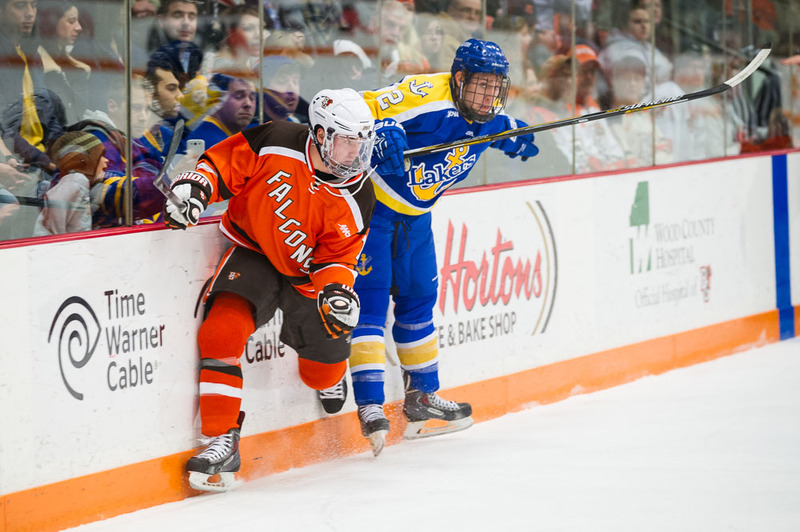 The Falcons, even if they win Saturday night’s series finale, most likely will fall in the national polls. 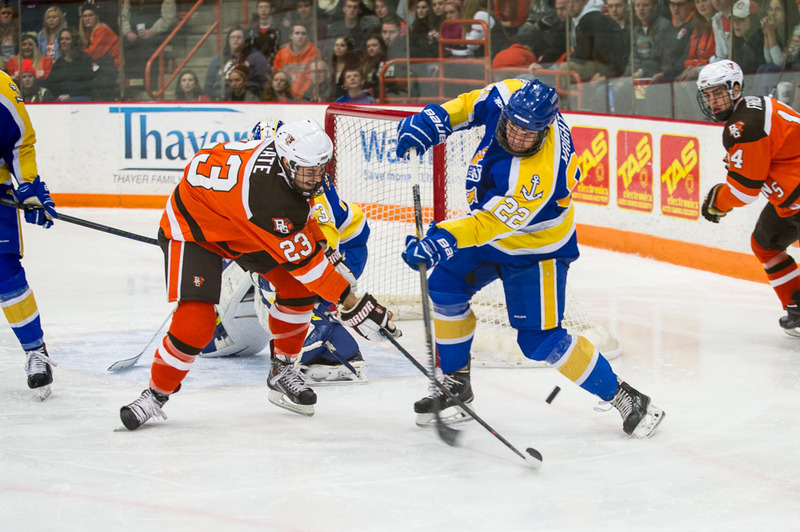 They’ll also drop in the Pairwise Rankings, which mimic the criteria used to select the teams for the NCAA playoffs. 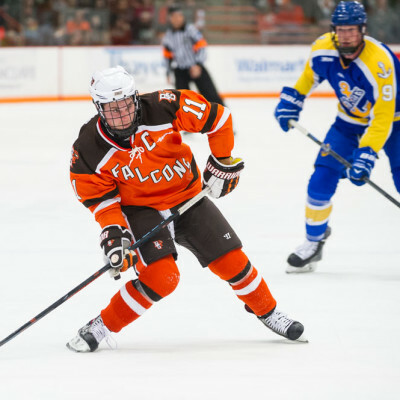 The loss was a disappointing one for the Falcons, who have steadily rebuilt their program during Bergeron’s four-plus seasons as head coach. 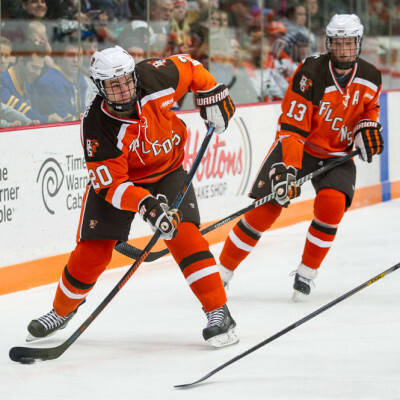 BG has earned its success this season by playing well most of the time. 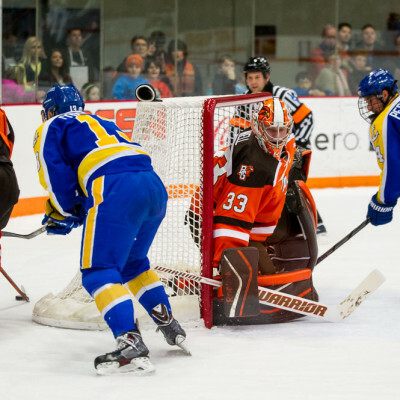 “We thought these kinds of games were behind us as a program. 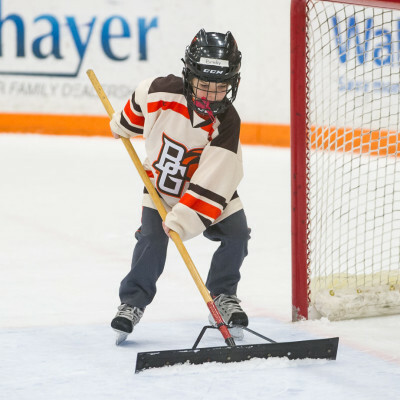 Obviously, not,” Bergeron said. 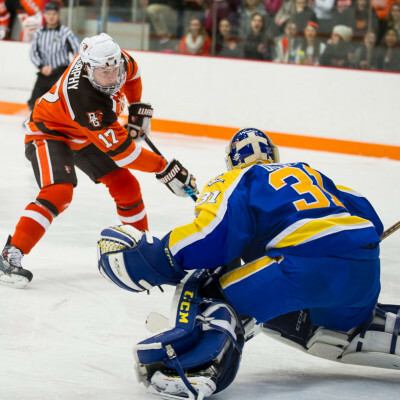 But the Lakers played a safe and smart game, and protected their freshman goalie well. 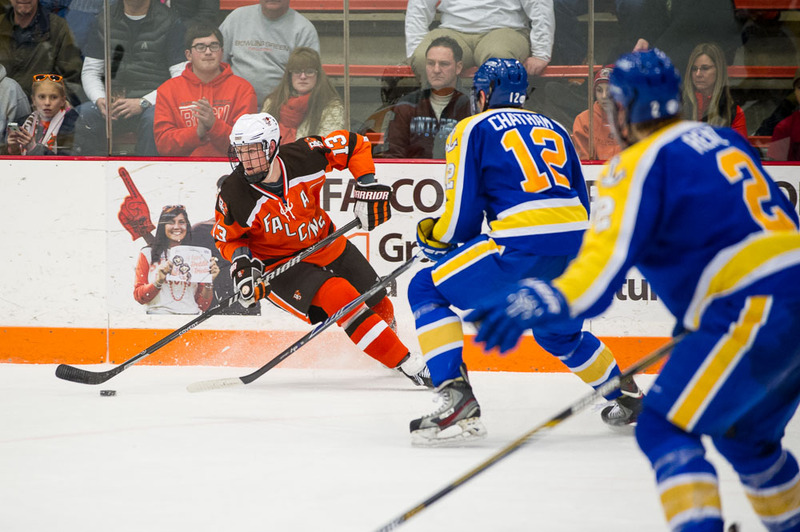 During the first two periods, the Falcons failed to play their usual puck-possession game in the offensive zone. 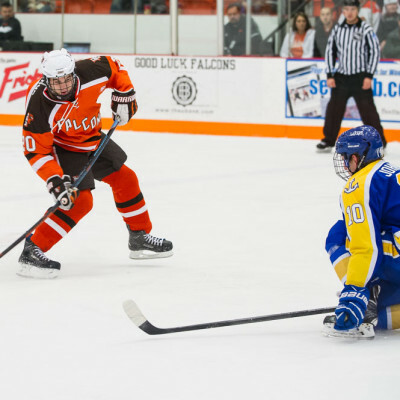 Usually, strong forechecking by the Falcons results in quality scoring chances and control of the game. 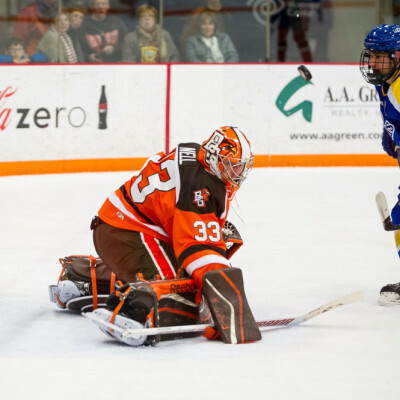 Defiel, who stopped 76 of 78 shots in a sweep of Bemidji State last weekend, was solid against against BG. 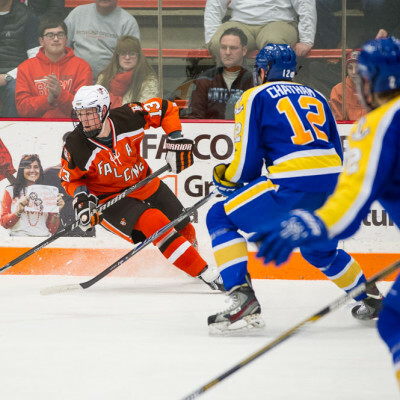 The Falcons had enough chances, but they didn’t have a large number of quality chances. 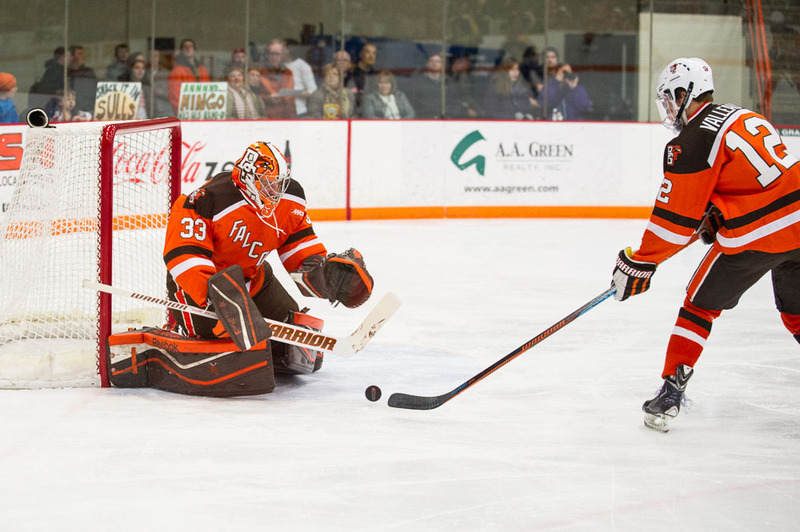 Entering the game, BG was second in the WCHA in scoring (3.50 goals per game) and Lake Superior was last in goals allowed (.367 gpg). 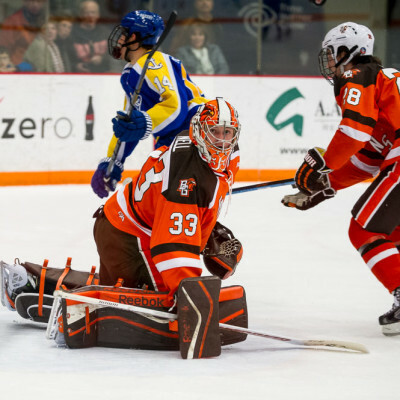 In his last five games before Friday, Defiel had a 1.88 goals-against average and a .950 save percentage. 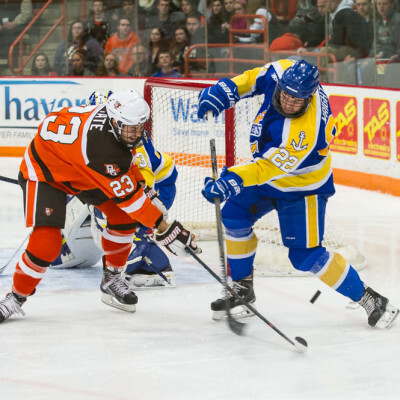 The Lakers built their 2-0 lead on goals from Bryce Schmitt at 4:01 and Eric Drapluk at 12:35. 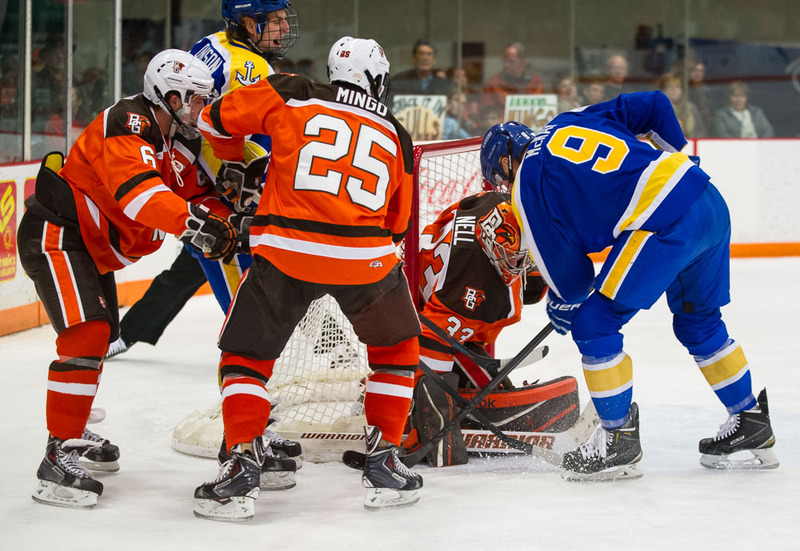 Schmitt was alone in front to take Luke Sandler’s pass from the left wings after BG turned the puck over in its defensive zone. 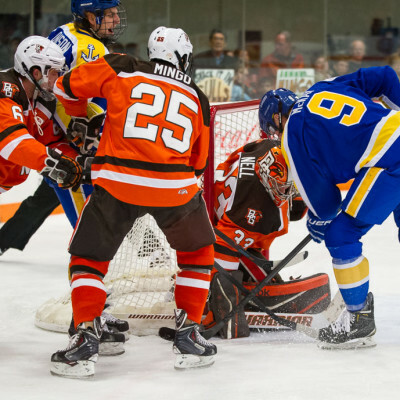 Drapluk broke in alone, scoring with a backhander from the right side of the crease. 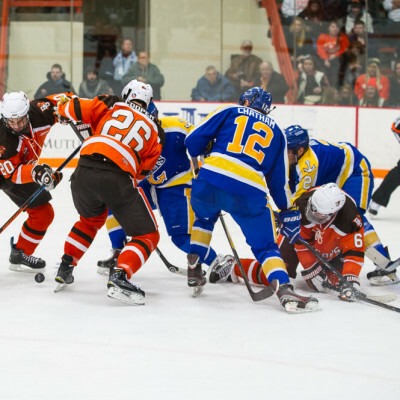 The play started with the Falcons turning the puck over at the offensive line. 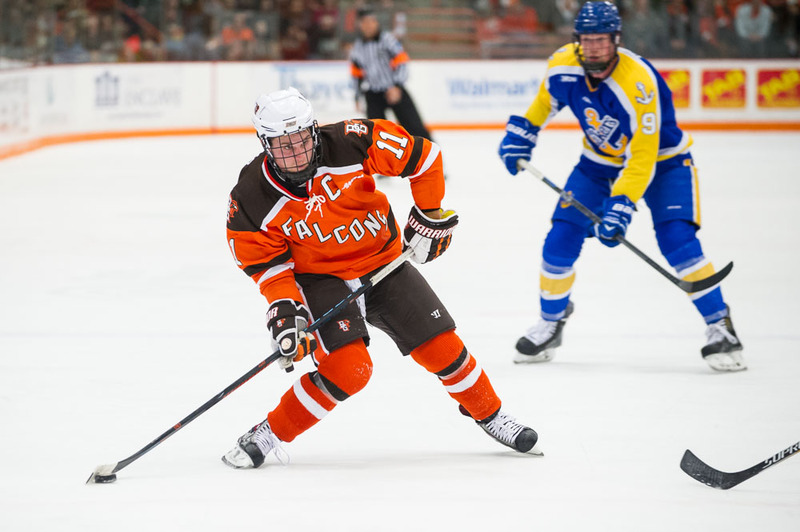 The Falcons cut their deficit on Kevin Dufour’s power-play goal with only 1:18 to play in the period. 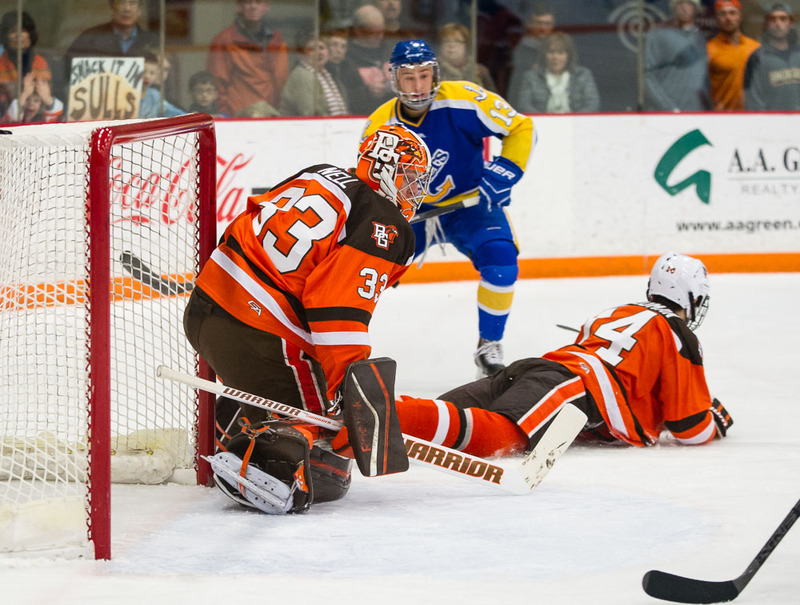 Defiel made the first save on Mark Friedman’s slap shot from the right point, but the rebound went straight to Dufour. 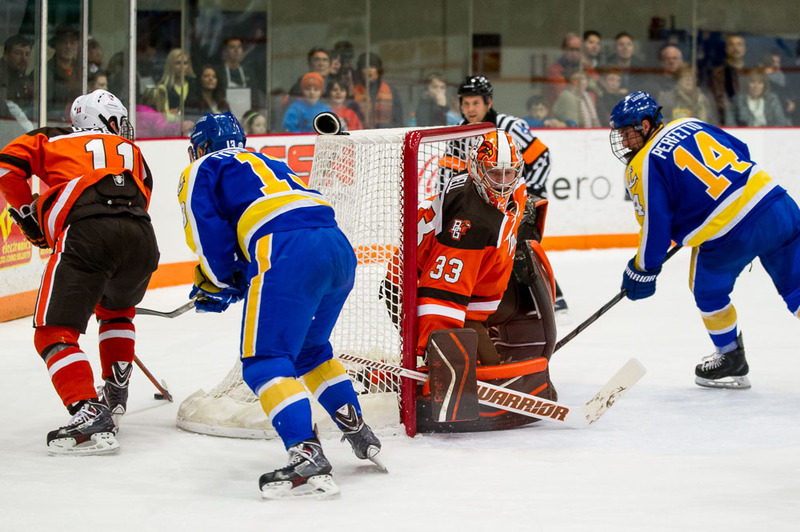 Dufour, parked just above the goal line to the right of the net, fired in the rebound from a tough angle as Defiel had no chance to recover. 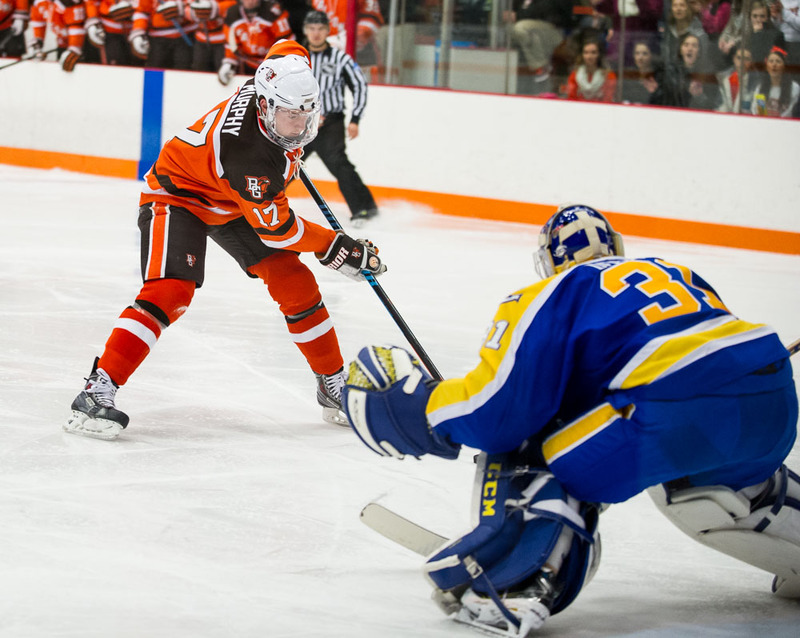 The goal was Dufour’s team-leading of the 11th of the season, but only his second in his last 14 games. 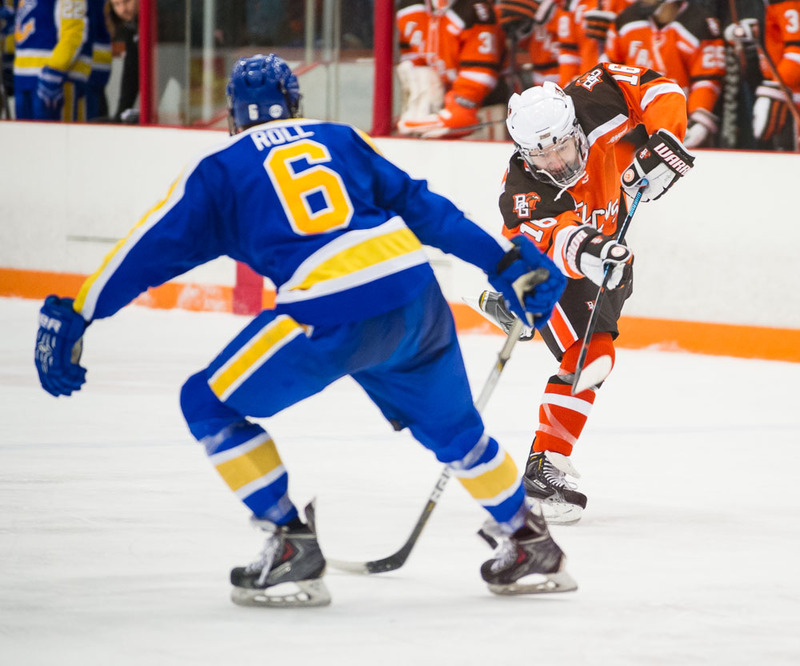 The sophomore left wing scored nine goals in BG’s first eight games. 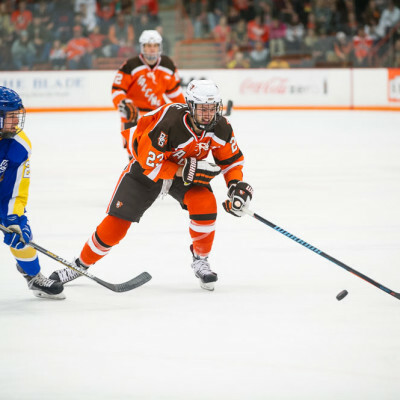 He returned to the lineup Friday after sitting out as a health scratch last Saturday’s win over Michigan Tech. 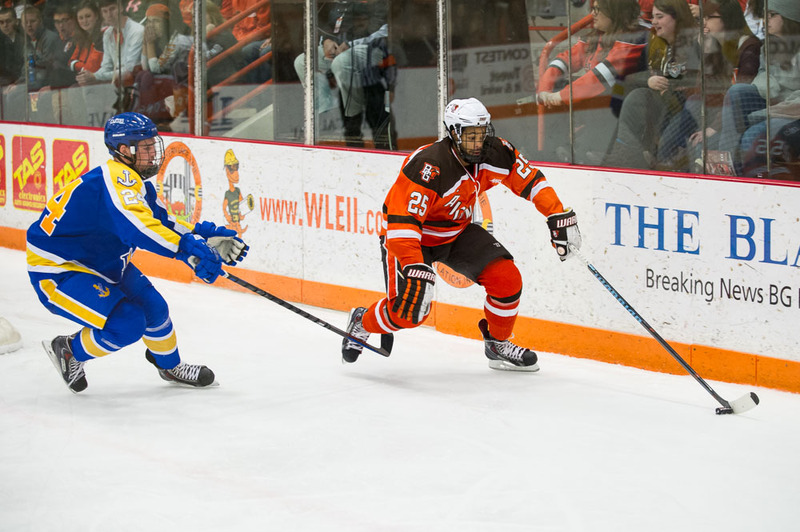 The Lakers regained their two-goal lead on Stephen Perfetto’s short-handed goal at 13:11 of the second period. 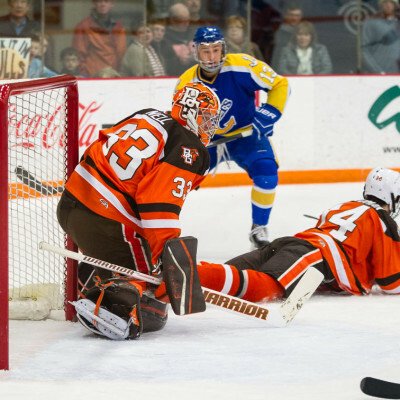 BG had an excellent scoring chance moments before Perfetto scored. 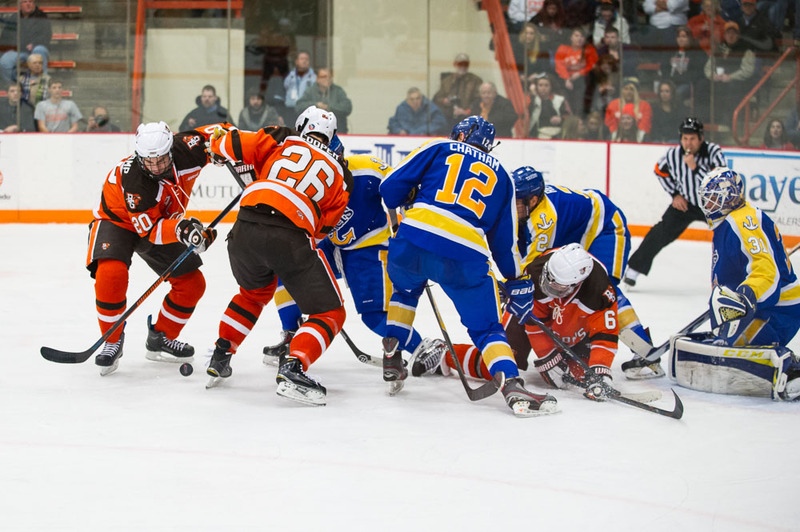 After the chance, the Falcons turned the puck over in the offensive zone as Lake Superior converted on a 2 on 1 rush. 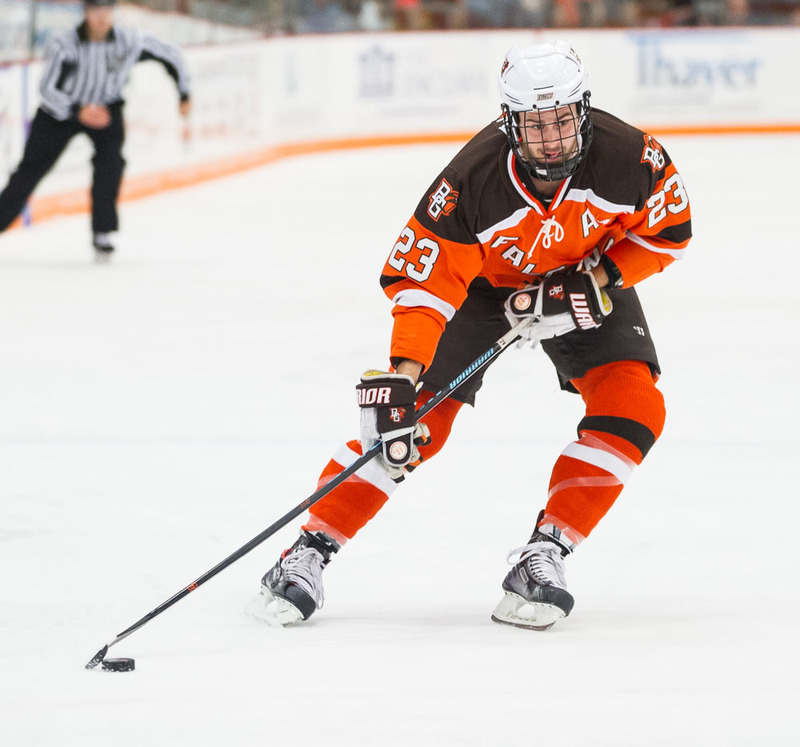 Perfetto scored from the right side of the crease, taking Gus Correale’s cross-ice pass from the left wing. 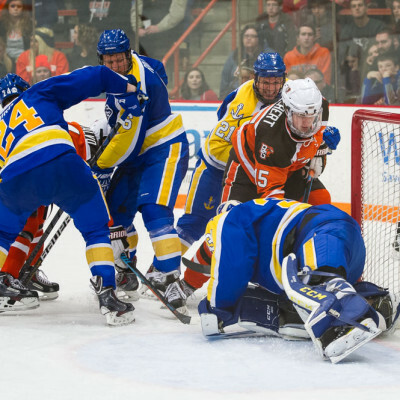 “After those turnovers, when you compete for a puck, you still have to make a play and they did that,” Bergeron said. 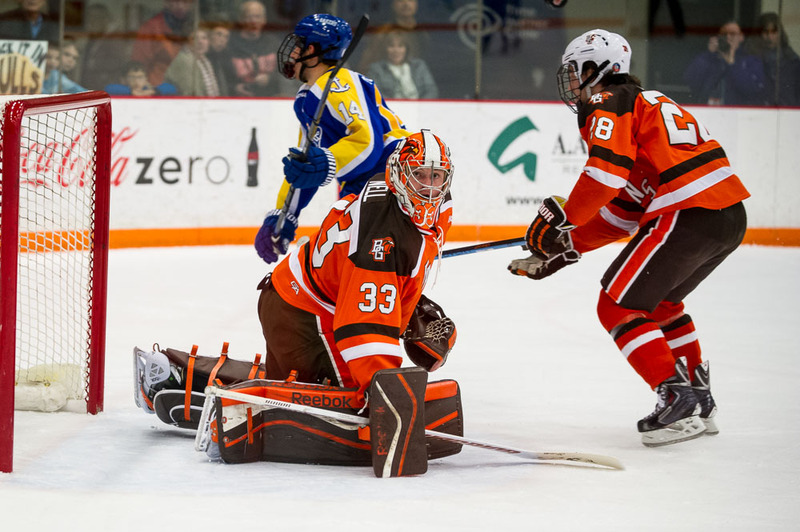 Nell had a rare off night in goal, stopping just 18 of 21 shots, although he didn’t have much help from his teammates at times. 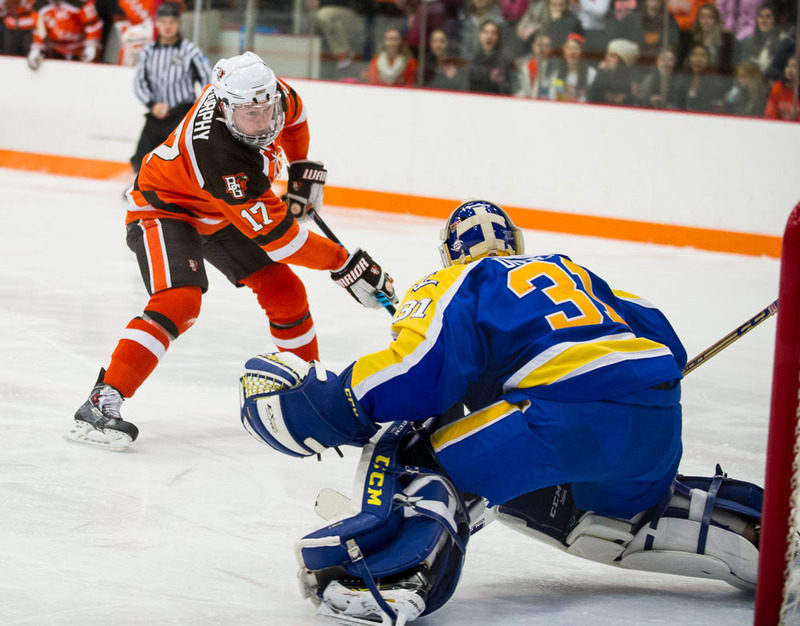 The freshman has a 1.88 goals-against average and a .930 save percentage in nine games. 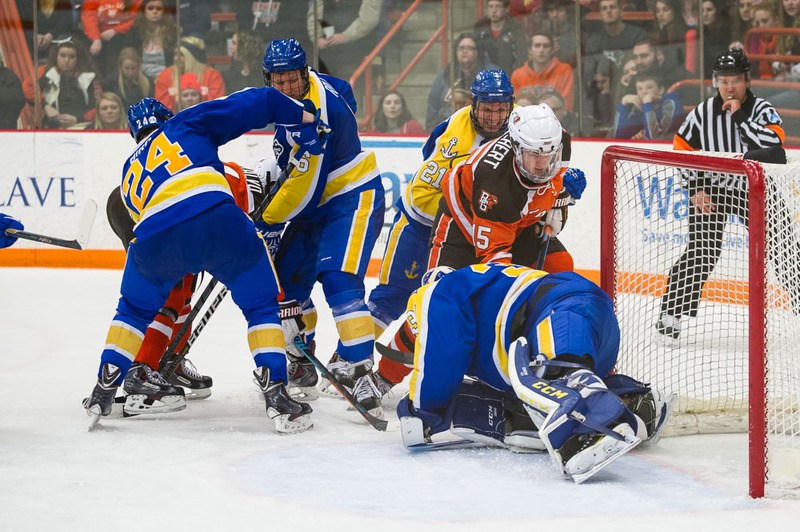 “He was just OK. We need better goaltending,” Bergeron said. 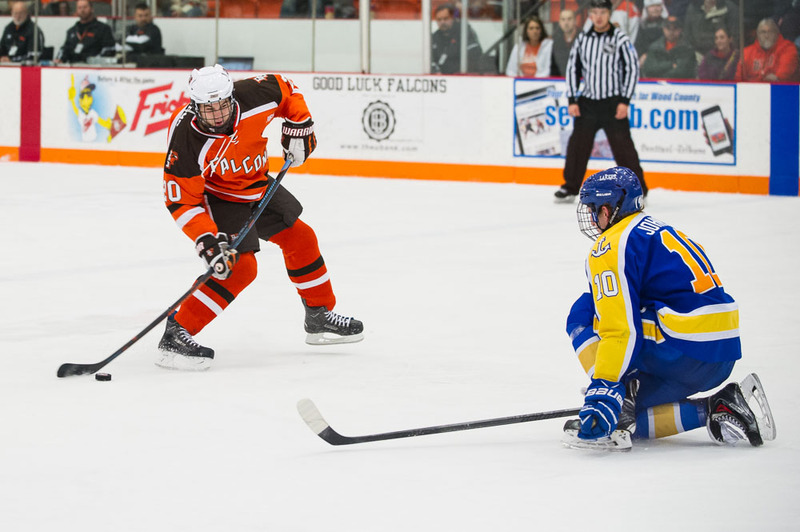 The Falcon penalty-killing, ranked first nationally at 93.5 percent, was 3 for 3. 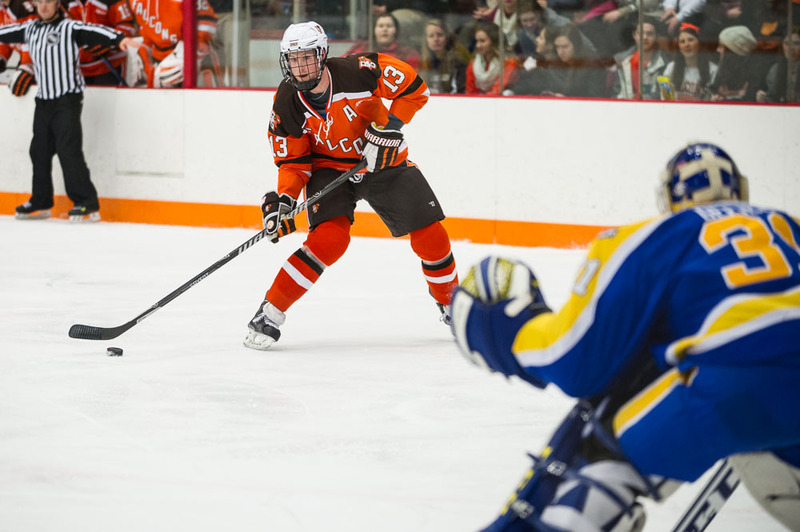 But the BG power play continued to struggle, going 1 of 5 and allowing the short-handed goal.